AIRBRUSH & BRUSH painting for the war gamer and model artist. Learn how to paint your wargaming armies/ models with this 2-day course that will teach you how to use an airbrush and traditional brush techniques to get your models painted quickly to a good tabletop standard. Bring your own assembled models to paint during the weekend! Day 1: Introduction to the 2 day course including a demonstration of airbrush types, their usage, maintenance and how use paints in the airbrush. This is followed by practising basic and intermediate airbrush strokes. We will then start applying these techniques to your own models using general basecoating methods. You will learn how to do panel lining as well as zenithal priming, pre-shading & pre-highlighting to achieve a monochrome effect with Badger Stynlrez primers. We will finish the day with basecoating your models with your chosen Badger Minitaire paints, and you will see the 'instant' shading & highlighting effects come to life. DAY 2: We will start with a look at everyone's models and discussing what you want to achieve with each one. Then we will warm up with general airbrush practise and move on to intermediate airbrush techniques such as using masking, templates, liquid mask and layering. You can use your choice of technique depending on what look and effects you are after. Other techniques we can show you are power weapons, painting faces, soot stains, heat staining, using Badger Ghost Tints and more. After the majority of the model has been painted, we can move on to traditional brush techniques such as drybrushing, edge highlighting, washes and other methods. Once you are happy with your model we will show you how to varnish your finish model. The day ends with a roundup and it's time to show off your creations! We recommend bringing multiple assembled vehicle and/or building models and several infantry models to work on during the weekend. Some sample models will be provided. 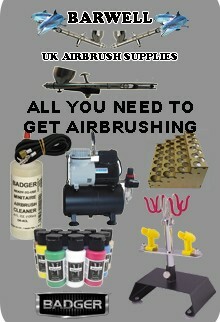 All other equipment, including airbrushes and paints, are provided. A maximum of 6 students will be in the class, The class will be taught in a purpose-built classroom, coffee tea and light refreshments will be provided throughout the day, as well as a buffet lunch.